By the time Lily was not quite three years old, she had already had five homes. Something of a whirling dervish, Lily seemingly never stops moving. She always prefers to carry something in her mouth and she usually runs instead of walks. She whines, circles, and wags incessantly. Her eyes dilate at the site of a ball and if someone is sucker enough to throw it once, she won’t leave them alone. A rescue in Georgia recognized Lily’s potential as a working dog and started training her for narcotics detection. However, budget cuts among K9 programs in the area left the rescue director concerned that Lily would embark on this career, only to lose it (and her sixth home!). So, she packed up Lily, put her on a plane, and sent her to her new life as a conservation detection dog. 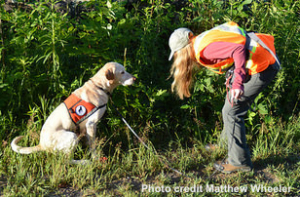 Her quirks and talents are serving her well, as she searches out endangered wildlife and invasive pests. And to top it all off, in addition to her work on conservation projects, Lily has taken a side job as a teacher. Lily works with humans who are new to dog-handling and teaches them how to work with (or for) a conservation detection dog. 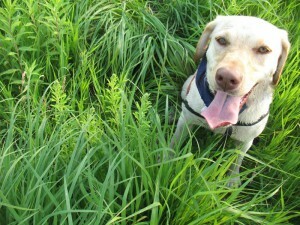 She has proven to be not only a great detection dog but a great teacher, too!